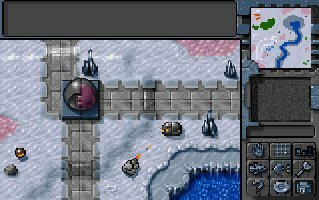 Hard Vaccum has a postmortem on the excellent Lost Garden blog here – the game saw itself as extending Dune 2, a RTS which was ahead of it’s time in many ways. In any case, in Hard Vaccum the supply lines largely auto-configured themselves, but required defending from enemy units. This works to some extent, but is more suited for a more tactical game, where individual resource flows are more important. Perhaps one more recent and moderately successful example was Perimeter, where you extended a flat zone around your base with terraforming, then extended you control onto it, sucking energy from the soil. Unfortunately, this was often done in a fairly formulaic way in the single player game, with areas you were “expected” to expand into, rather than encouraging non-set piece tactics. Perimeter’s multiplayer game was more interesting, but the actual fighting in the game was largely decoupled from the resource elements, you built units, combined them and sent them into the fray, storming through the enemy base. There was little tactical subtlety, and the sequel was awful, abandoning many of the more fun elements of the original. 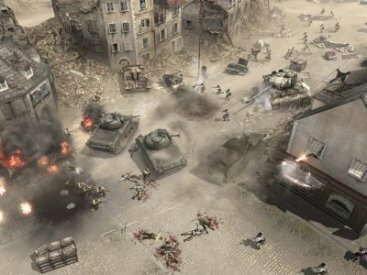 Another, albeit limited, concept is used in Company of Heroes, where you can capture points on the map – giving you resources when they link to your base, or allowing a deep strike to interfere with the enemy’s resource generation by cutting off a portion of their network. While an interesting concept, it means battles can heavily revolve around a few points, and that battles on the same map are far less freeform than Total Annihilation. Easy for the player to understand. Too many games concepts of supply are more frustrating than helpful . The “supply” concept can be as complex as necessary to the game’s designer, but must present a clean and useable interface to the end-user – complexity in design is not the same as complexity for the end user. Promote base-building, without making the map static. Introducing the concept of considering the layout of a base is a good thing, but allowing that base to be built where the player find convenient, rather than limited to fixed points on the map, prevent the game from becoming stale or forcing timed builds onto a map. Proper usage makes a real difference to the outcome of fighting. Many RTS games try, for example, boosting the power of some base units if another building is nearby, but that may mean for example that an expensive and fragile building which should not be exposed to enemy fire must be risked, and the player ends up not using the “supply” concept at all! Others, as mentioned before, simply “automate” supply to the level where it’s effectively invisible to the player.Equally, striking at an enemy’s AE-generating units should be a valid strategy, depriving him of a powerful bonus – while this should not be crippling, this requires either protection or redundancy in the AE network. Counters rushing. Supply line concepts can let us counter the bane of many a RTS, rushing, without requiring special adjustments – for example, low-end laser towers in the Total Annihilation balance mod UberHack had increased damage versus rush units – for that purpose. I’d prefer to avoid quite that crude type of adjustment, but there are other types of tweak we can make – as I’ll discuss in part 7 – which can be useful there. What magical concept can do all four? Well, for starters, your aura of energy is generated by energy-producing base structures. That’s right, your solar panels and fusion reactors produce AE, this being visible in the control view, and possibly specialist structures for some sides will be able to amplify or extend AE’s coverage. Bigger and more powerful power generating units will have larger AE radii, but a simple solar panel will allow units and structures placed directly next to them to benefit – allowing AE to be important from early in the game, and allowing the player redundancy in case of losing their big reactor. But, you say, what does AE actually do? Friendly units regenerate.This removes the need for the player to specifically repair each and every defending unit without liberally handing out self-repair capacity: attacking units can still suffer from attrition between fights, but defending units will have regenerated their health. This discourages early raiding and removes micro-management. Powerful buildings require AE. All top-tier buildings which are not themselves energy-generating will need to be within your AE to function. Your nuclear silos, advanced research institutes and annihilation lasers need those power plants! This adds strategic options of attacking the relatively vulnerable power-generating structures, and encourages “backup” AE generating structures next to critical parts of your base. Prevents capturing (Or may even be required for building captures). 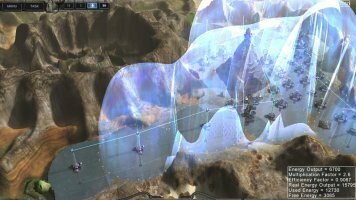 Capturing is usually either overpowered (hi, Homeworld!) or more often useless in RTS games – laden with too many special rules. Even in TA, capturing units was rare. By allowing capturing to occur on base structures relatively easily, but forcing the player to take out enemy AE-generating structures before they can do so, we ensure that a player must always build enough energy-generating structures and to properly support capture efforts with AE-generation of his own. Prevents base sprawl. Buildings cost an additional amount of energy to make outside the AE, this cost rising the further they are from friendly AE. Most expansions, thus, will be based around AE-producing buildings and taking out an expansion’s energy-producing building can make continuing with it, without rebuilding the AE-generating building (which are immune themselves to the rise in energy cost) expensive. Affects weapon behaviour. The most tentative of these concepts, AE might affect weapon behaviour. As will be discussed in article 6 (weapons and armor), energy and projectile weapons behave differently. Within AE, capacitors charge more rapidly, allowing energy-firing units to engage at higher rates of fire for longer. On the other hand, projectile weapons dissipate waste heat into the AE network, raising their rate of fire slightly. The reason this is more tentative is because the other effects may well have the desired results without needing this concept to be implemented, but it gives units on the defensive, especially energy-weapon using ones, greater punch. Allows aircraft reloading.A slightly separate concept to the above, many RTS games require aircraft to “return to base”, often causing path-finding issues as they land and take off. AE allows us to have aircraft simply return to friendly AE, resupplying in flight. This also gives aircraft carriers, for example, far more actual value – they can support powerful air squadrons well away from other AE-generating units! This list hopefully gives you some idea of how AE and a “supply line” concept might be used in RTS game, a truly strategic game, to enhance the gameplay without becoming a micromanagement burden to the player!